As with our Rightaway Delivery mantra, everything we do is done with the highest level of customer service. Try us and see why our customers have made Rightaway their choice. With close to 40 trucks, Rightaway Delivery offers regional services all over Michigan and northern Ohio and northern Indiana, which allows for increased delivery efficiency, time sensitivity, and a personal service that you won’t get from any other company. With our strategically placed hub in Romulus conveniently located next to Detroit Metropolitan Airport and our GPS/real-time reporting trucks, we can offer you timely deliveries, constant knowledge of your freight locations and 24/7 service. Since 1999 Rightaway Delivery has been delivering time sensitive packages and documents throughout the entire Midwest region. 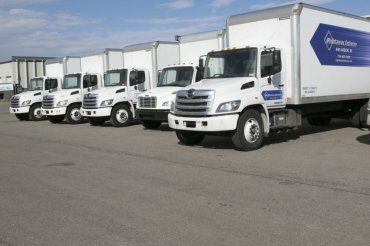 Whether it’s medicine and supplies for in-home patients, live organs for transplant, legal documents for court filings, mechanical parts for broken down machinery, or anything that needs to be delivered quickly and efficiently, our “on-demand” couriers are ready to take care of your delivery needs at a moment’s notice any time of the day or night. We can get your “yesterday” delivery taken care of today. Very customer-focused service model which has been exemplary in meeting the specialized requirements of home infusion patients and our home infustion pharmacy. At Columbus Delivery & Logistics in NYC, we do not take lightly our industry relationships. Rightaway has proven to be a valuable and trustworthy partner. We enjoy working with Ben Kaplan and his team, as they understand the idiosyncrasies of our industry and the demands which accompany them. The information shared with us is always accurate and timely. They understand the complexities of running a brick and mortar operation, along with an appreciation of the costs associated with doing so. All staff, including upper management and Ben himself, are hands-on and available 24/7. We can always reach a live person and not just a recorded message or answering service. They also respect a partner's need to maintain cash flow and payments are very timely. All of the above contributed toward their reputation as a well known and respectable company. When I worked for the University of Michigan Health Systems is when I first met with Ben and the Rightaway crew. We used their services to deliver patient's medical durable goods to houses, schools and businesses. Their drivers were very professional to patients and families. We also used the inventory management systems to keep track of wheelcahirs and beds. Ben really cares about his business and reputation. Keep up the good work! Scott Patton, Onsite Process Specialist, XPO Logistics, Inc.
Rightaway Delivery is a valued logistics partner of Quality Transportation. 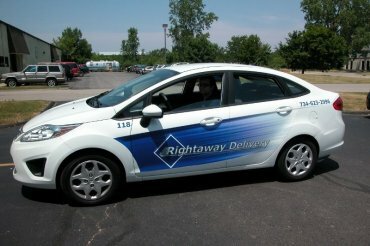 Since 2007, Rightaway has been our valued logistics partner in the midwest. Their team has demonstrated time and again their commiotment to quality service, professional communication, and a 100% dedication to patient care. Many kudos to your entire team! We have been using Rightaway for quite a few years now. Their fast and friendly service is fantastic. The delivery staff at Rightaway have always been friendly and professional no matter what we have asked of them. They have vehicles to handle many different types of deliveries. Rightaway Delivery has made a difference in the service that we can provide our customers. Doing good business requires good people. Ben and Rightaway Delivery is one of the good guys in our industry. We would not be successful in the Midwest without the support, partnership, and excellent services from the Rightaway team. Thank you Ben and the Rightaway Team! If you value excellence, commitment and integrity, Ben Kaplan is the kind of man you want to do business with. Period. Bill Roberson, CEO, Chase Couriers & Logistics, Inc.
Rightaway Delivery sent two of the most helpful people to assist getting my extremely large and heavy display case into my building. Manni and Sean -- thank you for your professionalism and assistance. You went above and beyond for this job, and I truly appreciate you! Always makes my deliveries on time and they are fast and professional. Someone is always on the phones and has an answer for me when I call and have a question. We've used them for years now, best delivering company in the Ann Arbor area with competitive prices! Great company with a great team! Always keeping the customer's needs as their top priority! Learn more about what we're up to by stopping by our Blog.